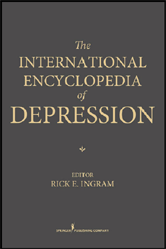 This encyclopedia distills an amazing amount of information into a book that is easy to read and navigate .This would serve as a great reference for anyone with an interest in depression. Score: 96, 4 stars--Doody'sDepression is the second most disabling disorder in the world. On a daily basis, virtually all practicing psychologists, psychiatrists, and social workers confront patients with primary or secondary depression. The wealth of information available globally on depression is enormous, but has not been summarized into a comprehensive encyclopedia-until now. Experts from around the globe have been selected to present interdisciplinary coverage of all the essential issues related to depression, including use of medication, treatment therapies and models, symptoms of Depression, related disorders, and more. Entries are conveniently organized into subcategories in order to provide the most in-depth coverage of each subject.